For many individuals across both sides of The Pond, the 1980s invokes fond memories of Duran Duran’s Rio and Michael Jackson’s Thriller. However for homosexuals, the 1980s was a time of great fear and uncertainty. AIDS (originally known as GRID - Gay-related immune deficiency) was waging war upon the homosexual community. Initially AIDS was considered a ‘gay disease’. Homosexuals were blindsided by its ferociousness because government agencies were not interested in acknowledging its existence. 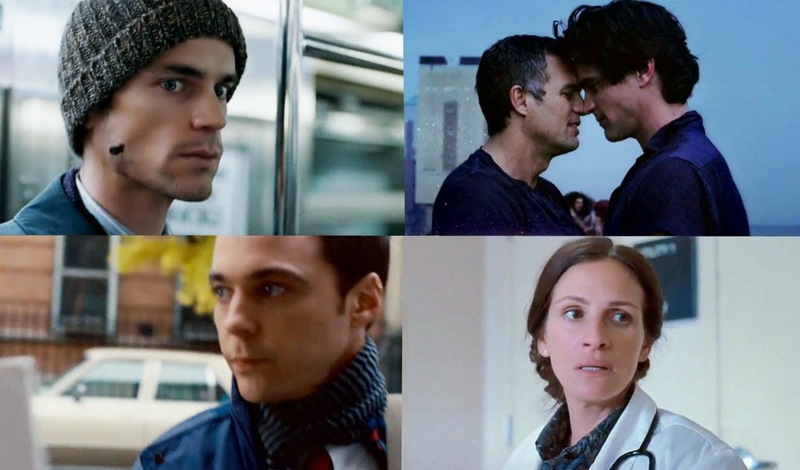 Though the rise and initial impact of AIDs epidemic is the crux of HBO’s The Normal Heart, this film shows that underneath the uncertainty and death individuals still managed to find love. Ryan Murphy (co-creator of American Horror Story and Glee) used his directing skills to bring Larry Kramer’s play from the stage to television; Kramer also wrote the adaptation. HBO has a long tradition of casting movie and television stars in its films. This film featured Mark Ruffalo (Marvel’s The Avengers), Julia Roberts ( August: Osage County), Taylor Kitsch (Friday Night Lights), Matthew Bomer (White Collar), Alfred Molina (An Education), and Jim Parsons (The Big Bang Theory). The Normal Heart was produced by Ryan Murphy, Brad Pitt, and Mark Ruffalo (along with many others). The Normal Heart was a riveting film because of its performers. They put their ‘hearts’ into crafting fully-formed human beings in the span of two hours and fifteen minutes. Ned Weeks (Mark Ruffalo) unleashed his ‘inner Hulk’ in order to ignite anger and passion within New York City’s gay community to fight for its survival. Ned’s approach often brought him into physical and verbal conflict with his friend Bruce Niles (Taylor Kitsch). Bruce’s method was very different. Unlike Ned, Bruce was not independently wealthy and could not afford to create too many politically connected enemies. This would have been detrimental to Bruce’s career as reservist in the United States Military. Initially Bruce and Ned were able to co-exist within their outreach organization, Gay Men’s Health Crisis. However Ned’s tactics ultimately lead him to being exiled from the group he co-founded. At the beginning of Ned’s crusade, he met and fell in love with New York Times Reporter Felix Turner (Matt Bomer). Unfortunately Ned and Felix’s are unable to live happily ever after; Felix was diagnosed with AIDS. Felix’s deterioration is heartbreaking to watch. The Normal Heart showed numerous characters displaying scars and other physical symptoms. However, the writer and director took it one step further with Felix. During a scene on the subway, the audience saw how AIDS psychologically affected Felix. Matt Bomer’s physical transformation eerily resembled the one undertaken by Matthew McConaughy for Dallas Buyer’s Club. When Tommy Boatwright, Jim Parson’s character, first appeared I kept trying to figure out which time machine Sheldon Cooper used to travel back to 1981. Upon further reflection I was thankful that ‘Sheldon’ manifested in Tommy at times. The character injected a small dose of levity into a very solemn film. Only Parsons could deliver a line in which Tommy asks Hiram Keebler (True Blood and American Horror Story’s Denis O'Hare) if he was related to makers of Keebler Crackers. During a funeral service Tommy gave a eulogy that painted a bleak picture, but added a touch of ‘Sheldon’ that made it easier to swallow. Parsons (and the creative team) wisely chose to incorporate some non-Sheldon attributes into Tommy. Tommy smoked cigarettes, punched an anti-gay protester, and was not germaphobe. Though The Normal Heart featured numerous astonishing performances and moments, it was not a flawless film. I found Dr. Emma Brookner’s (Julia Roberts) outbursts of anger very annoying. Yelling appeared to be Dr. Brookner’s only trait; I wondered if the character was trying to compensate because she was confined to a wheelchair. There were only a couple of moments throughout the film in which I connected with Dr. Brookner. Ironically, Julia Roberts’ character in August: Osage County was also prone to loud transmissions of feelings and information. Unfortunately Dr. Emma Brookner lacked an emotional balance that was found in Roberts’ August: Osage County character. One of the reoccurring themes in the film was closure, specifically between alienated family members. I was a bit disappointed this did not occur for one central character. When Felix told Ned about his ex-wife and child, I thought the foundation was being laid for a future payoff. I was wrong. This was unfortunate because many characters including Finn Wittrock’s Albert (one of Bruce’s lovers) and Ned were given time and space to explore this possibility. Fortunately Felix was the catalysis used to help Ben Weeks (Alfred Molina) come to understand and truly accept his brother, Ned. By producing programs such as The Normal Heart, HBO continues to support examining the evolution of homosexual culture in America. Earlier in 2014 HBO and Sky transmitted Looking, a contemporary dramedy featuring gay friends searching for love (and finding themselves) in San Francisco. Comparing both programs would be a bit absurd, but it is fascinating to imagine societal differences between the early 1980s and 2014. The Normal Heart educates its audience about a critical period of time not only for homosexuals about also heterosexuals. This film was emotionally demanding and challenging, but it was worth the effort. This reviewer was emotionally drained after watching the film. Though death was the inevitable outcome for several characters, I was invested in seeing the characters (and their relationships) through until the end.